By comparison, slightly more than half (52%) of Hispanics ages 5 and older in Miami are proficient in English. Nearly two-thirds (65%) of all U.S. Hispanics ages 5 and older are proficient in English. 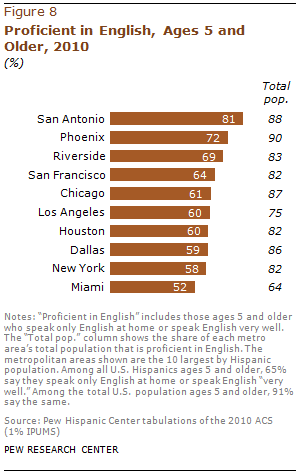 Other than San Antonio, two metropolitan areas among the top 60 have rates of English proficiency above 80%. 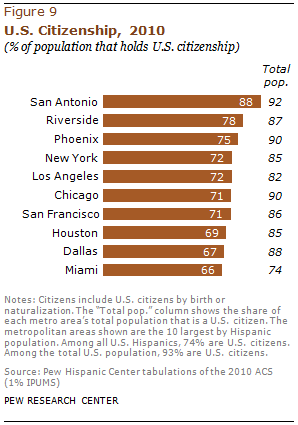 Albuquerque, N.M., has an 85% proficiency rate among Hispanics ages 5 and older and Corpus Christi, Texas, is second with 84%; they are ranked 26th and 46th in Hispanic population, respectively. Miami has the lowest rate of U.S. citizenship among its Hispanic population (66%). Nearly three-quarters (74%) of all U.S. Hispanics are U.S. citizens by birth or naturalization.